The World Beer Cup took place in Nashville last week and a good amount of Canadian breweries won awards including Hell's Basement, Corsaire, and Rebellion! Congratulations to all Canadian breweries that won awards at the event! It's about time for me to finally review a beer by Rebellion Brewing, I've been a fan of them for over two years now but since I never get the chance to visit Saskatchewan, I rarely get to sample their products. I picked this beer up back in the fall, so I forgot what I picked up - I was thinking that this was going to be a mead, but it's a Barley Wine instead - The Mind Evaporator Barleywine. When I was taking photos of this beer at 3:30 AM, I was feeling like some sort of spirits were in the room watching me taking the photos, even to a point where I saw a black blurb go across my camera's screen as I was adjusting the settings in live view.. creepy huh? The barleywine is described as being a mysterious and complex barleywine aged in bourbon barrels. It has notes of caramel, brown sugar, boozy fruit cake, and marmalade, with a dry oaky finish and a dank lingering bitterness. 11.0% ABV. 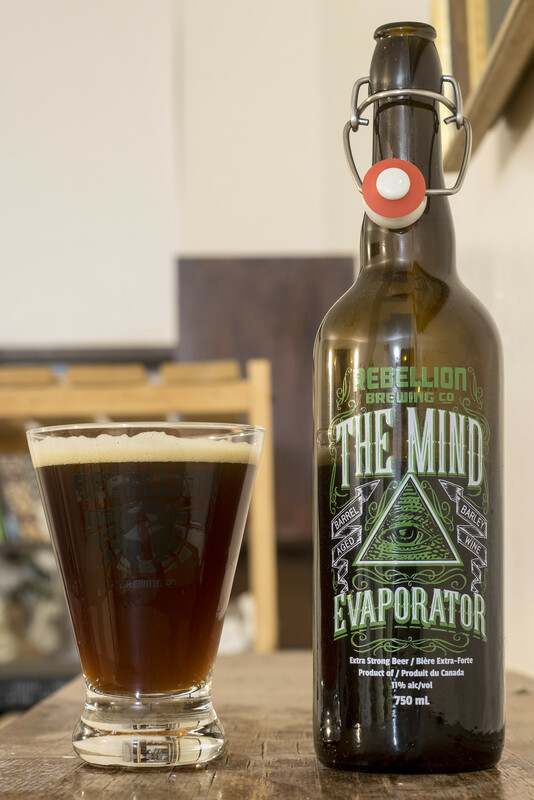 Appearance: Mind Evaporator pours a dark mahogany brown body with a light amount of carbonation in the body, and a nice beige head on top initially but gradually diminishes to a slim layer and a bit of lacing on the side of the glass. Aroma: Rich, boozy, sweet, and woody. Before I read that this was bourbon barrel aged, I didn't realize it was barrel aged at all, in fact.. the barrel aged presence is fairly light, but once it warms up it gives off a bit more of the barrel aged goodness consisting of a mild oaky woodiness, a good presence of booziness that's to be expected with this already being 11.0%, and a light amount of caramel and vanilla notes. There's a bit of a dark fruit presence of raisins and plum, a hint of floral hoppiness, and ends off with a hint of a sweet bubble gum presence in it. So far, this isn't as heavy as your typical syrupy in-your-face barley wines. Taste: Decently malt-forward with a good deal of caramel, dark fruits (raisins, plums), and bubble gum. The barrel aged presence is more prevalent this time around as I'm getting a bit of bourbon, a nice amount of warmth from the booze, a bit of vanilla and the typical woodiness you see from your everyday awesome oak barrels. I'm finding this not as heavy as most barleywines as the mouthfeel is actually quite light and not syrupy, while the flavour itself seems a bit more sweet bubble gum forward and less dark fruit.. oh and I'm not feeling an alcohol burn from the sample I had. Thankfully this bottle has a swing top so I can save the rest for later. Edit: as it warms up more and more, the oaky notes pop out more and more.. yum! Overall Thoughts: While it's lighter than I expected, I wish I bought a second bottle to age for a few years to see how it ages.. but that can always be done the next time I see a bottle if I'm ever back in Sask! Decently raisiny, but surprisingly bubble gum forward and not feeling a burning sensation at 11%.